Funds flow from operating activities of $3.3 million were 67 percent lower than the $10.0 million recorded in the prior quarter, and 70 percent lower than the $10.9 million reported in the third quarter of 2014. The reduction in funds flow is primarily due to Zargon's sharply lower third quarter 2015 field oil prices of $44.67 per barrel, down 48 percent from the third quarter 2014 field oil price of $86.61 per barrel and down 21 percent from the second quarter 2015 field oil price of $56.55 per barrel. Reflecting restricted conventional capital programs, third quarter 2015 production averaged 3,633 barrels of oil and liquids per day, a two percent decrease from the preceding quarter and third quarter 2015 natural gas production averaged 5.3 million cubic feet per day, unchanged from the preceding quarter. Total production averaged 4,513 barrels of oil equivalent per day, a two percent decrease from the preceding quarter. During the quarter, oil and liquids production represented 81 percent of total production based on a 6:1 equivalent basis. At quarter end, Zargon recognized a non-cash impairment charge to property, plant and equipment assets of $56.7 million, primarily due to lower forecasted future commodity prices. Three monthly cash dividends of $0.01 per common share were declared in the third quarter of 2015 for a total of $0.9 million. These cash dividends were equivalent to a payout ratio of 27 percent of funds flow from operating activities. This $0.01 per common share monthly dividend has subsequently been suspended. Third quarter 2015 exploration and development capital expenditures (excluding property acquisitions and dispositions) were $6.9 million and included $5.0 million of expenditures related to the Little Bow ASP project ($2.8 million exploitation and $2.2 million chemical costs). In the quarter, Zargon drilled 3.0 gross (3.0 net) Little Bow ASP wells. Funds flow from operating activities is an additional GAAP term that represents net earnings/loss and asset retirement expenditures except for non-cash items. Working capital deficiency excludes derivative assets/liabilities. The calculation of barrels of oil equivalent ("boe") is based on the conversion ratio that six thousand cubic feet of natural gas is equivalent to one barrel of oil. Zargon Oil & Gas Ltd. has released its financial and operating results for the third quarter of 2015. As a result of volatile, uncertain and exceptionally low oil prices, Zargon's Board of Directors have decided to suspend the Company's monthly dividend until further notice. The Company estimates this action will reduce annual cash outlays by approximately $3.6 million. The $0.01 per common share dividend declared by the Board of Directors on October 15, 2015, will be paid on November 16, 2015, to shareholders of record at the close of business on October 31, 2015. Subsequent to the quarter end, Zargon's bank syndicate members have completed their semi-annual review of Zargon's committed syndicated credit facilities to incorporate significantly lower oil price forecasts, and have elected to reduce the credit facilities' committed borrowing base by 20 percent to $88 million from $110 million. This reduced borrowing base compares with the Company's outstanding bank debt of $52.0 million at September 30, 2015. The credit facilities continue to be fully revolving until June 22, 2016, with the provision for an annual extension at the option of the lenders and upon request from Zargon. At the end of the third quarter, Zargon had $117.0 million in total debt, net of working capital (excluding unrealized derivative assets/liabilities). This total includes $52.0 million of bank debt drawn and $57.5 million of convertible debentures. The convertible debentures (TSX:ZAR.DB) bear interest at a rate of six percent per annum, which is payable semi-annually, in arrears, on June 30 and December 31. The debentures mature on June 30, 2017, at which time Zargon may redeem the debentures with cash or through the issuance of Zargon common shares priced at 95 percent of the then current Zargon share price. In a response to the sustained low oil price environment, Zargon has continued to focus on reducing general and administrative, operating and transportation and capital costs. Although costs do vary by quarter, good progress has been made with the overall trends. In particular, general and administrative costs and transactions costs (inclusive of one-time adjustments) have been reduced from $13.4 million in 2014, to $8.6 million (projected) in 2015 and $6.5 million (forecast) in 2016. These reductions have been accomplished through office staff reductions (38 percent), comprehensive cost reviews, salary roll backs, consultant rate reductions and office space adjustments. Similarly, operating and transportation costs have been reduced from $43 million in 2014, to $36 million (projected) in 2015 and $31 million (forecast) in 2016. These reductions have been accomplished through lower margin property sales (now completed), comprehensive cost reviews, field supplier and consultant reductions and field office consolidations. In particular, the projected 2016 cost savings reflect lower electricity costs, lower field contractor costs and reduced Little Bow ASP facility and field pumping costs due to improved pumping designs. Cost containment programs have also been implemented for conventional and ASP oil exploitation capital programs and, in aggregate, have permitted the December drilling of three additional ASP infills without increasing the year's $25 million budget. Finally, ASP chemical supply contracts have been renegotiated with realized price reductions of up to 15 percent. In March 2014, Zargon commenced chemical injection of large volumes of dilute chemical solution into the partially depleted Little Bow Mannville I pool to recover incremental oil reserves. To date, 5.8 million barrels of ASP solution has been injected into the first phase of the project. This injection volume is equal to about 18 percent of the targeted reservoir pore volume, and represents 26 percent of the total chemical bank (ASP and polymer only) scheduled to be injected in the phase 1 operation. Earlier this year, Zargon announced that although the project's produced oil cuts had demonstrated encouraging oil banking trends, total oil production volumes had not met expectations. To address this performance issue, Zargon increased the injected surfactant concentrations and undertook a now completed summer-fall 2015 remedial and optimization program, which included the conversion of two additional ASP injectors, multiple producer workovers, the drilling of three producing wells, and the replacement/repair of selected ASP injection lines. The initial production results (provided graphically below) from the program are encouraging and show improved ASP project oil rates due to new wells, improved oil cuts and increased production/injection rates. To view the graphic "Little Bow ASP: Phase 1 Production," please visit the following link: http://media3.marketwire.com/docs/zar1111phase1.jpg. Based on the positive fall three well program results, an additional three infill producing wells will be drilled in December 2015. In aggregate, Zargon is forecasting that these three infill wells, in conjunction with the current oil cut and fluid production trends will take the total phase 1 production levels to more than 600 barrels of oil per day by the end of the 2016 second quarter (400 barrels per day of incremental ASP production plus 200 barrels per day of base waterflood production). Zargon's independent reserves evaluator, McDaniel & Associates Consultants Ltd., has assigned 4.48 million barrels of proved and probable (non-producing and undeveloped) oil and liquids reserves to the Little Bow ASP project in its 2014 year end reserve appraisal. An updated reserve report, which incorporates the impact of the delayed production response, the recent encouraging production trends, this year's six additional wells and revised operating and chemical cost data will be provided prior to the end of January 2016. For further information regarding the Little Bow ASP project, please refer to our updated corporate presentation, which is available at www.zargon.ca. In addition to the $5.0 million of ASP exploitation and chemical capital expenditures, Zargon spent $1.9 million on conventional oil exploitation capital programs in the third quarter of 2015. These conventional capital programs focused on minor waterflood and facility modifications that continue to enable Zargon to have an industry low base oil production decline of 13 percent per year. Zargon has not drilled any conventional oil exploitation wells in 2015. Zargon's non-ASP conventional properties tend to be pressure supported by waterflood injections or natural reservoir aquifers and consequently provide long-life low-decline oil volumes. Approximately half of these production volumes are produced from Mississippian (Midale, Frobisher, Alida equiv., Tilston) horizons in the Williston Basin core area. In aggregate, the conventional properties bring more than 75 horizontal locations that can be methodically drilled as oil prices improve in order to deliver stable (or growing) non-ASP oil production volumes for many years. Zargon's 2015 total capital budget continues to be set at $25 million (excluding $0.5 million relating to final statement of adjustments for prior year dispositions) of which approximately $7.4 million remains to be spent in the fourth quarter. This remaining 2015 capital budget will be allocated $1.1 million to conventional expenditures, $3.6 million for ASP chemicals and $2.7 million for ASP exploitation expenditures. Despite the addition of $2.2 million of costs for the three December 2015 Little Bow ASP development locations, other budgeted capital costs have been reallocated and the total field capital 2015 budget remains unchanged. For 2016, we are forecasting a $16 million capital budget which is comprised of $4 million of conventional expenditures and $12 million for ASP chemical costs. The follow-on polymer injection costs for phase 1 are expected to average $4 million per year during the 2017 through 2019 period. Phase 2 expansion capital has been deferred until realized field oil prices increase from the current depressed levels. The 2016 drilling program does not anticipate the drilling of either conventional oil exploitation or Little Bow ASP wells. Zargon has entered into an oil hedging program to provide a measure of stability and predictability to cash flows as we wait for the ASP production volumes to ramp up and oil prices to improve. For the remainder of 2015, Zargon has hedged 1,500 barrels per day at $79.78 Cdn/bbl WTI, while for the first half of 2016 an average of 500 barrels per day is hedged at $79.30 Cdn/bbl WTI. In the August 13, 2015 second quarter results press release, Zargon provided 2015 third quarter oil production guidance of 3,650 barrels of oil and liquids per day (including incremental ASP volumes). Actual third quarter volumes essentially met guidance and were 3,633 barrels of oil and liquids per day. Previously, Zargon had set the 2015 third quarter natural gas production guidance at 5.0 million cubic feet per day, a level that was exceeded by actual third quarter volumes of 5.3 million cubic feet per day. For the 2015 fourth quarter, oil and liquid volumes are forecast to average 3,650 barrels of oil per day, a level that incorporates 230 barrels of oil per day of incremental ASP production, up from 100 and 75 barrels of oil per day in the 2015 third and second quarters, respectively. Fourth quarter natural gas production guidance is forecast to average 5.0 million cubic feet per day. 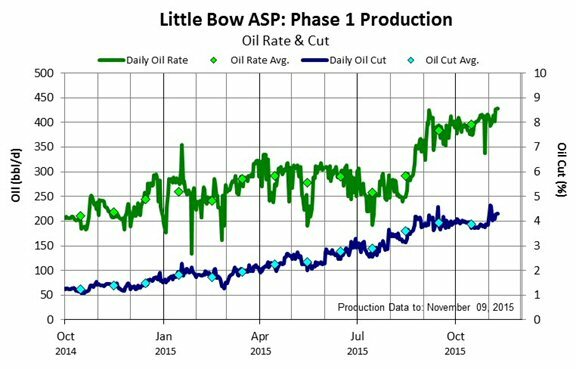 Looking forward to 2016, increasing oil production volumes from the Little Bow ASP project are forecasted to completely offset the effects of the 13 percent base decline from the conventional oil properties, and an average production rate of 3,650 barrels of oil per day is forecasted to be maintained throughout the year. This forecast assumes that no additional wells are drilled on either the Little Bow ASP or conventional oil exploitation properties. Significant oil production growth could be obtained if a drilling budget was implemented. Natural gas volumes are forecasted to average 4.6 million cubic feet per day in 2016. In the August 13, 2015 press release, Zargon announced the formation of a Special Board Committee ("the Committee") to examine alternatives that would maximize shareholder value in a manner that would recognize the Company's fundamental inherent value related to Zargon's long-life, low-decline conventional oil assets and the significant long term oil potential related to the Little Bow ASP project. This ongoing strategic and financial review might include, but is not limited to a strategic financing, merger or other business combination, sale of the Company or a portion of the Company's business or assets or any combination thereof, as well as the continued execution of its business plan. Upon consideration of market trends and the recent/forecast positive Little Bow ASP results (improved operational performance, encouraging drilling results and increasing oil cuts and oil rates), the Committee is planning to commence a formal Company/asset marketing process in early 2016. This timing would permit the finalization of Zargon's 2015 year end independent reserves appraisal, which would incorporate the drilling of three additional Little Bow ASP wells in December 2015. The Company expects to provide updated disclosure regarding this strategic alternatives process prior to the end of the 2016 first quarter. This press release offers our assessment of Zargon's future plans and operations as at November 11, 2015, and contains certain forward-looking information and statements within the meaning of applicable securities laws. The use of any of the words "anticipate", "continue", "estimate", "expect", "forecast", "may", "will", "project", "should", "plan", "intend", "believe" and similar expressions (including the negatives thereof) are intended to identify forward-looking information or statements. In particular, but without limiting the foregoing, this news release contains forward-looking information and statements pertaining to the following: our suspension of dividend referred to under the heading "Suspension of Dividend"; guidance as to our 2015 and 2016 capital budgets, including the allocation thereof and the sources of funding and various plans, forecasts and estimates as to drilling cost reduction initiatives, and other operational forecasts and plans and results therefrom under the headings "Ongoing Cost Reduction Initiatives", "Little Bow Alkaline Surfactant Polymer ("ASP") Project Update", "Conventional Oil Exploitation Activates" and "2015 & 2016 Outlook"; our expectations on reducing general and administrative, operating and transportation costs referred to under the heading "Ongoing Cost Reduction Initiatives"; our plans with respect to our Little Bow ASP project and the results therefrom referred to under the headings "Ongoing Cost Reduction Initiatives", "Little Bow Alkaline Surfactant Polymer ("ASP") Project Update", "Production Guidance" and "Strategic Alternatives Process Update"; our plans for our hedges under the heading "2015 & 2016 Outlook"; our strategic alternatives process under the heading "Strategic Alternatives Process Update"; and all matters, including guidance as to our estimated 2015 and 2016 production and production mix, under the heading "Production Guidance". The forward-looking information and statements included in this news release are not guarantees of future performance and should not be unduly relied upon. Such information and statements involve known and unknown risks, uncertainties and other factors that may cause actual results or events to differ materially from those anticipated in such forward-looking information or statements including, without limitation: those relating to results of operations and financial condition; general economic conditions; industry conditions; changes in regulatory and taxation regimes; volatility of commodity prices; escalation of operating and capital costs; currency fluctuations; the availability of services; imprecision of reserve estimates; geological, technical, drilling and processing problems; environmental risks; weather; the lack of availability of qualified personnel or management; stock market volatility; the ability to access sufficient capital from internal and external sources; and competition from other industry participants for, among other things, capital, services, acquisitions of reserves, undeveloped lands and skilled personnel. Risks are described in more detail in our Annual Information Form, which is available on www.zargon.ca and on www.sedar.com. Forward-looking statements are provided to allow investors to have a greater understanding of our business. You are cautioned that the assumptions used in the preparation of such information and statements, including, among other things: future oil and natural gas prices; future capital expenditure levels; future production levels; future exchange rates; the cost of developing and expanding our assets; our ability to obtain equipment in a timely manner to carry out development activities; our ability to market our oil and natural gas successfully to current and new customers; the impact of increasing competition; the availability of adequate and acceptable debt and equity financing and funds from operations to fund our planned expenditures; and our ability to add production and reserves through our development and acquisition activities, although considered reasonable at the time of preparation, may prove to be imprecise and, as such, undue reliance should not be placed on forward-looking statements. Our actual results, performance, or achievement could differ materially from those expressed in, or implied by, these forward-looking statements. We can give no assurance that any of the events anticipated will transpire or occur, or if any of them do, what benefits we will derive from them. The forward-looking information and statements contained in this document is expressly qualified by this cautionary statement. Our policy for updating forward-looking statements is that Zargon disclaims, except as required by law, any intention or obligation to update or revise any forward-looking statements, whether as a result of new information, future events or otherwise. Zargon uses the following terms for measurement within this press release that do not have a standardized prescribed meaning under Canadian generally accepted accounting principles ("GAAP") and these measurements may not be comparable with the calculation of similar measurements of other entities. The terms "funds flow from operating activities" and "operating netback per boe" in this press release are not recognized measures under GAAP. Management of Zargon believes that in addition to net earnings and cash flows from operating activities as defined by GAAP, these terms are useful supplemental measures to evaluate operating performance and assess leverage. Users are cautioned; however, that these measures should not be construed as an alternative to net earnings or cash flows from operating activities determined in accordance with GAAP as an indication of Zargon's performance. Zargon considers funds flow from operating activities to be an important measure of Zargon's ability to generate the funds necessary to finance capital expenditures, pay dividends and repay debt. All references to funds flow from operating activities throughout this press release are based on cash provided by operating activities before the change in non-cash working capital since Zargon believes the timing of collection, payment or incurrence of these items involves a high degree of discretion and, as such, may not be useful for evaluating Zargon's operating performance. Zargon's method of calculating funds flow from operating activities may differ from that of other companies and, accordingly, may not be comparable to measures used by other companies. Funds flow from operating activities per basic share is calculated using the same weighted average basic shares outstanding as is used in calculating earnings per basic share. See Zargon's Management's Discussion and Analysis ("MD&A") as filed on www.zargon.ca and on www.sedar.com for the periods ended September 30, 2015 and 2014 for a discussion of cash flows from operating activities and funds flow from operating activities. In conformity with National Instrument 51-101, Standards for Disclosure of Oil and Gas Activities ("NI 51-101"), natural gas volumes have been converted to barrels of oil equivalent ("boe") using a conversion rate of six thousand cubic feet of natural gas to one barrel of oil. In certain circumstances, natural gas liquid volumes have been converted to a thousand cubic feet equivalent ("mcfe") on the basis of one barrel of natural gas liquids to six thousand cubic feet of gas. Boes and mcfes may be misleading, particularly if used in isolation. A conversion ratio of one barrel to six thousand cubic feet of natural gas is based on an energy equivalency conversion method primarily applicable at the burner tip and does not represent a value equivalency at the wellhead. Given that the value ratio based on the current price of crude oil as compared to natural gas is significantly different from the energy equivalency of 6:1, utilizing a conversion ratio on a 6:1 basis may be misleading as an indication of value. Zargon has filed with Canadian securities regulatory authorities its unaudited financial statements for the three and nine months ended September 30, 2015 and the accompanying MD&A. These filings are available on www.zargon.ca and under Zargon's SEDAR profile on www.sedar.com. Based in Calgary, Alberta, Zargon's securities trade on the Toronto Stock Exchange and there are currently approximately 30.302 million common shares outstanding. Zargon Oil & Gas Ltd. is a Calgary based oil and natural gas company working in the Western Canadian and Williston sedimentary basins and is focused on oil exploitation projects (waterfloods and recently tertiary ASP) that profitably increase oil production and recovery factors from existing oil reservoirs. About this company Zargon Oil & Gas Ltd.